Feng shui and the Chinese symbol of love is a common query among feng shui enthusiasts. There are many schools of thought on this and it can be hard to interpret what will work for you. Even though there are many types of feng shui not all of the schools or theories will resonate with each individual. Of all of the methods I have had great results in regard to the Flying Stars Method of Feng Shui. There are many ways to use Flying Stars for love and qualified consultant is best for more advanced methods. However, there are some easy things that you can implement on your own. Some other suggestions for feng shui love cures is to have a symbol or Chinese character that translates the word love. This can work for some people, but for most people in the west they simply do not understand the character and it really holds little meaning for them personally. I often recommend that a person not use something that is out of alignment with themselves because they just won't achieve the desired result. Using a symbol like the one above is one such instance that I would most likely advise against. I do not believe that filling your sacred space with such things that are not in alignment with you is most effective. How would this symbol work, you ask? Easy, if it fits into your decor and you are OK with the character. Another great way that this would be most effective is if perhaps YOU ARE Chinese; meaning you can read and/or write in the language and this character has meaning for you or it is part of your ethnicity and you accept it on that basis. Now I don't know about you but I think this is one good-looking duck, however, this has no meaning of love for me. 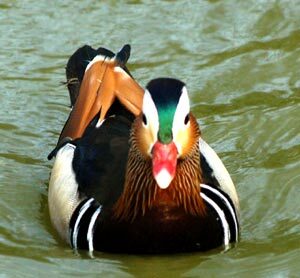 Typically it is advised that a pair of Mandarin ducks represent love. There are two reasons this is used in feng shui. First, the word Mandarin is also a Chinese dialect- AHA!!!! That is why it is suggested, it just seems or sounds more Chinese. So that makes it authentic...??? I know... this all sounds so weird if you don't 'get it.' It is OK. That is my point there are things that will work symbolically and things that will not. This is an easy way to tell what will and will NOT work for you. By using these examples above you can get a better understanding of just what their true purpose is. It is not that these objects hold any power, but that they hold suggestion to you that your mind uses in a productive manner to manifest what is is you seek. If you are looking for symbols of love for your space they should be items that harmoniously meld with with your current decor, enhance it, or are meaningful to you. For certain reasons, I knew I client I was working with would benefit from the addition of something that symbolized love to her. After much discussion and consideration we concluded that this picture was something that would accomplish the feeling and theory we were indeed looking for. It worked, in fact, after all we had done it worked in only about three months time. This actual print was implemented into her space and complemented her decor in such a way that worked with her and her needs. Of course, every one is individual in this respect and we also used other methods of feng shui as well to really make an impact. Love is closer than you think with feng shui, and the happiness you seek is only waiting in you to find it.